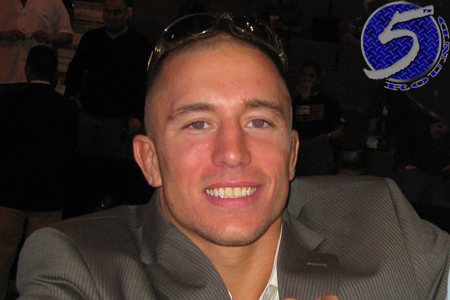 When now-former UFC welterweight king Georges St-Pierre (pictured) abruptly vacated his title and left the planet’s premier mixed martial arts promotion at the peak of his illustrious career late last year, he was far from transparent behind the reasons why. The 32-year-old vaguely said at the time that he had some “personal issues” he needed to take care of and that he “might” return to MMA one day. He has held his secret under lock and key ever since – despite rumors circulating that he fathered a child he didn’t want to keep, his own father was on his deathbed and that St-Pierre owed his prior manager millions in future earnings. “As a competitor, as a fighter, it’s a good thing to have it because it makes you better, because you completely obsess about being a better martial artist,” St-Pierre stated. “Every day, everything that you do is oriented toward that goal. This same obsession I have about my work, my job, to make me better, it was going to drive me crazy. That’s why I took that break. I don’t call it a retirement because I don’t know if it will be, but I had to step out of the competition for a while. This news shouldn’t be too surprising if you piece together various interviews St-Pierre conducted prior to his leave. He has mentioned obsessively studying and thinking about his opponents as he prepares to fight them. In fact, St-Pierre said the same thing about Johny Hendricks, the man GSP beat in a highly controversial decision last November just before exiting MMA. After St-Pierre announced his leave, he suggested the UFC’s decision not to publicly back him in trying to enforce a stricter drug testing policy also played a role in his decision. St-Pierre told CBS News that if one day he decides to return to the cage, performance-enhancing drugs need to be addressed. “I never wanted to hurt the sport, hurt the UFC,” St-Pierre said of challenging MMA’s drug epidemic. “I always wanted to be one of the guys fighting for the legitimacy of the sport, and because [PEDs] is a big problem, like every other sport – I would say even more because it’s a new sport – so they need to change it, they need to do something for that … If I come back, there’s going to have to be some change made – on the drug [testing policy], a lot of things. A lot of things on my life, also. St-Pierre owns a 25-2 professional record. He is the UFC’s most decorated welterweight champion having defended his throne nine consecutive times. Hendricks and Robbie Lawler will battle for his vacant title next month at UFC 171.